What Should Your Kitchen Remodel Cost? 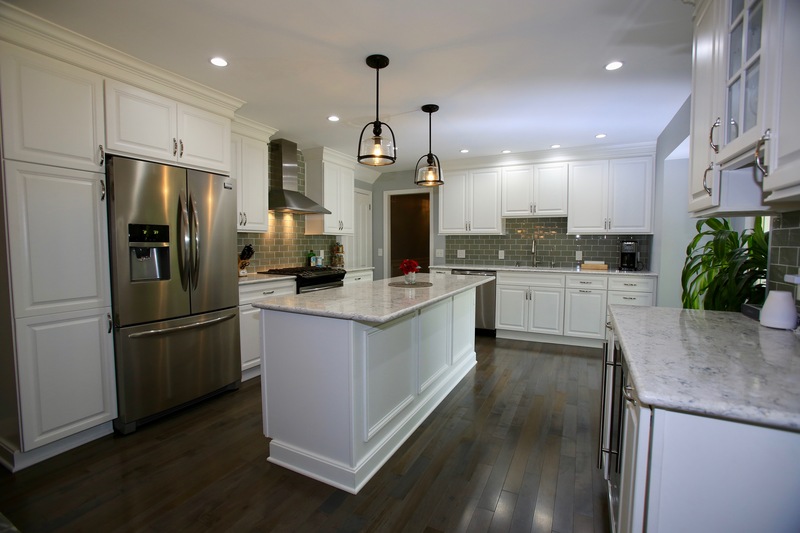 Figuring out a reasonable budget for your kitchen remodel can be almost as challenging as figuring out where to start (link to starting a kitchen remodel article). We’ve found that a reasonable budget goes a long way to ensure you’ll love your new kitchen. To help you set a reasonable budget this article outlines a general rule of thumb on costs, breaks down high-cost items, and includes a budgeting secret that can greatly improve your kitchen remodeling experience. As a general rule, you can expect to spend between 12-18% of your home’s value for a full kitchen remodel. In the Bridgewater New Jersey area (where we work) the typical full kitchen remodels ranges from $50,000 to $100,000 or more. If you’re local to our neighborhood then you can expect to spend somewhere in that range depending on your wants and needs. If you’re outside the Bridgewater area then using the percentage rule of thumb will get you close to what you should be spending on your kitchen. A range between $50,000 – $100,000 isn’t especially helpful when trying to come up with a budget so let’s dive into a few factors that determine costs. For the purpose of this article, we’ll be talking mainly about full kitchen remodels which are explained in further detail below. What is a Full Kitchen Remodel and do I Need One? Most kitchen remodels wind up being full remodels even if they don’t initially start out as one. A full remodel involves stripping the kitchen down to bare studs. This means taking out the cabinets, appliances, insulation, old electrical, and plumbing. It seems a bit crazy to rip everything out of your kitchen but there are a few very compelling reasons to do a full kitchen remodel, especially if your current kitchen is 15-30 years old. Kitchens are a lot like an old car. Over time rust corrodes the underside of the car, the looks are outdated, some of the electronic stop working, and the vehicle you used to love no longer fits your needs. At this point, it’s easiest and often most cost effective to replace the old car with a new one. The electrical, plumbing and insulation in your kitchen’s walls are no different. Over 15-30 years electrical codes change, plumbing leaks, and insulation packs down. It is possible to avoid some of these expenses if you keep the exact layout of your old kitchen however, this is a lot like repainting the outside of your old car to find that your transmission needs an overhaul. It’s a risky endeavor. There’s good news, if you decide to move anything in your kitchen (the sink, a wall, appliances, etc.) it’s often more cost-effective to remove everything. The benefit of going this route is twofold: you save money and your kitchen meets the current electrical codes, and better fits your wants and needs. In most cases planning for a full kitchen remodel makes the most sense financially and in terms of getting the best possible kitchen for your family. Now that we’ve run through the benefits of a full kitchen remodel let’s get down to talking costs. Going back to the $50,000 – $100,000 range, what is the difference between the two price points? It turns out that the costs of your kitchen are primarily impacted by three major items: cabinets, appliance, and countertops. These three items in a kitchen generally account for between 45-65% of the entire budget. If we look at the range again it’s easy to see that the finishing pieces create the most variability in pricing. Figuring out a more definitive budget comes down to figuring out how much you’re willing to spend on these three things. The nice to have vs need to have list discussed in our previous article (link to article) is a perfect tool for making decisions at this point in the process. Say for instance one of your need to haves is a top of the line range, knowing this you’ll need to decide whether you want to spend less on say cabinets or increase the overall budget. If you’re struggling to figure out the big decisions it might be worth hiring a designer/developer company as they’ll be able to walk you through the cost implications of your kitchen chooses. We outlined some of the benefits of hiring a designer/developer company here (link to the previous article). Once you’ve got a rough number in mind most people suggest that you add 15% as a contingency plan. This is good advice if you’re not sure about the contractor you’re hiring or working with someone competing solely based on price. Instead of planning for the worst we think it makes sense to ensure a better future. This means doing the homework and taking the time to find a reputable and honest contractor. Finding a reputable, competent, and honest contractor is a bit like buying a magic crystal ball. A good contractor will be able to walk into your kitchen and figure out all the problem areas and “unknowns” because they’ve seen it all before. This means you’ll get a more accurate quote and can use the 15% contingency plan as a tool to get your dream kitchen. What Should You Use the 15% Contingency Plan for Then? We’ve found that most of our customers wind up making small (and sometimes not so small) changes during the selection process. These changes can quickly add up and are also the ones that leave you the most excited about your new kitchen. Initially, when you’re designing your kitchen you might settle on a standard granite countertop at a cost of $60/foot. When you go to the store to look at the countertop it turns out there’s another option that’s fantastic, way better than you could have imagined but it costs $150/foot. Having the contingency budget gives you the flexibility to make design changes that turn your kitchen from great into remarkable. It means being able to more than double the cost of one selection without stressing about your budget. In the end, it means a better overall remodel experience and a kitchen you love. Over and over again we’ve seen our clients use this “secret” to get their dream kitchens. We hope you’re able to use this trick to get your dream kitchen. Still, Have Questions or Want to Chat With Us? We hope you’ve found the article useful and are well on your way to figuring out your kitchen budget. If you have any questions about budgeting or your kitchen remodel in general please feel free to reach out to marcus@mfmdc.com or give us a call at (908) 581-2229. If you’re ready to start your remodeling project and would like us to provide you with an estimate please fill out the form below to give us a little more information so we can set-up a time to talk about your project.